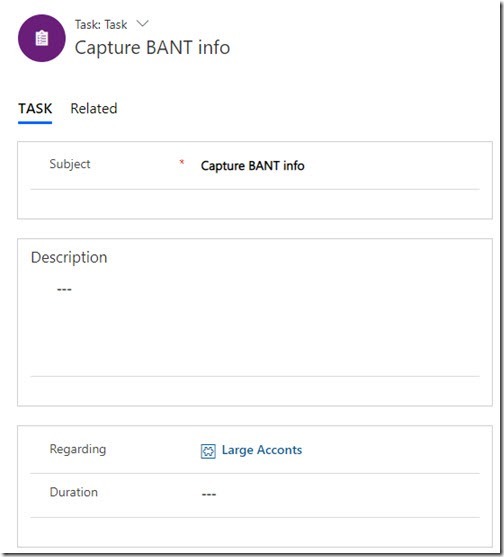 Microsoft recently released Playbooks for Dynamics 365 for Sales and Customer Engagement. What are these, how might you use them, and what should you be careful about when working with them? Let's take a quick look at all of those items. Spoiler Alert: I'm not a big fan. When you read over the official documentation (click here) and play around a bit, the functionality is intriguing, but might be a bit disappointing once you put it into production. What are Dynamics 365 Sales Playbooks? In the Sales Hub app, users with the right security role can create a playbook by navigating to the App Settings area, creating a new Playbook Template record, giving it a name, assigning a category, determining which entity(ies) it belongs to, and adding a set of activities to it. It's about that simple. For detailed instructions on creating a playbook, here is that link to the official Playbook documentation again. Personally, I'm not a big fan of creating a large series of activities for a user all at once. Too often this seems to result in an overwhelming list of activities to work through and users give up on activity management. But there may be scenarios in which this might work, so let's dive a little deeper. Playbooks can be "called" from an entity that they're assigned to (Lead, Opportunity, Quote, Order or Invoice). For example, if one or more playbooks are assigned to the Opportunity entity, a user can open an opportunity, click the Launch Playbook button, select the playbook, and run it. Just like that, the playbook runs. That's a lot of navigation for most users to go through in order to work a task list. But, you say, most users use the Activity entity to work their tasks. What is this experience like when it comes to playbooks? Unfortunately it’s worse! 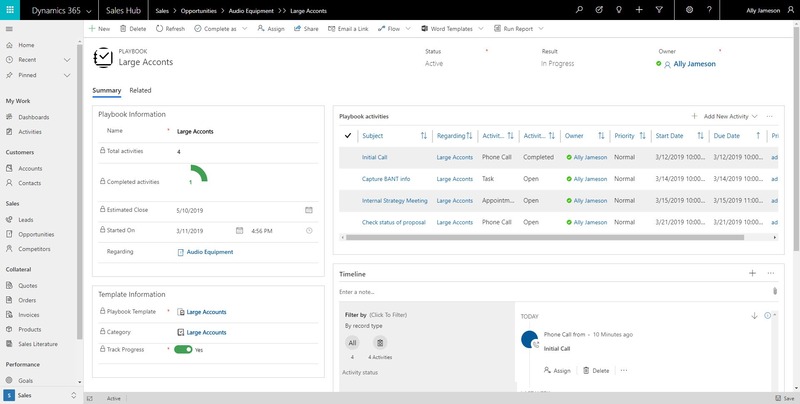 In the nearby image you can see a task that was created as a part of a Dynamics 365 for Sales Playbook for an Opportunity. What don’t you see? Links or information about the Opportunity! As the user I would have no idea what to do with this task until I click the regarding link and then from the Playbook form, I’d probably also need to click the link to the opportunity to learn about it, then navigate back to the playbook to work the list of activites. Again – way too much navigation for most users. 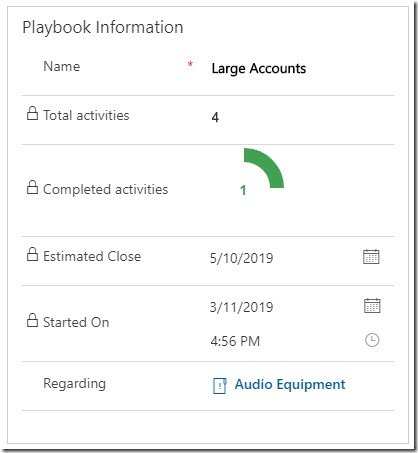 So When Should I Use Dynamics 365 Playbooks? If you have a strategic selling team that is very well versed in Dynamics 365, that can adopt complex functionality pretty quickly, and you have playbooks where the activities are mostly all completed in one sitting, then playbooks may work for you. If you use workflows to trigger playbooks, and use workflows to populate the playbook with meaningful information so that records are a little easier to find, there may be a fit. The bottom-line: I'm hard pressed to find a scenario that works. But this is new functionality - maybe I'm missing something or maybe Microsoft has a long-term plan to build something more useful on this foundation. Microsoft has announced that documents and sales literature will soon be able to be aligned to playbooks. This is promising and hopefully these items will be made visible to users in a more intuitive format. 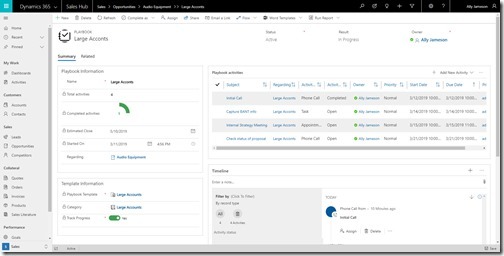 A number of other options exist for helping your sales team to work with CRM activities and to provide playbook type information in Dynamics 365. Contact C5 Insight for more information.